Travellers from Australia coming to New Zealand. To create engaging signage (using existing sites) to be displayed in airports in Australia. 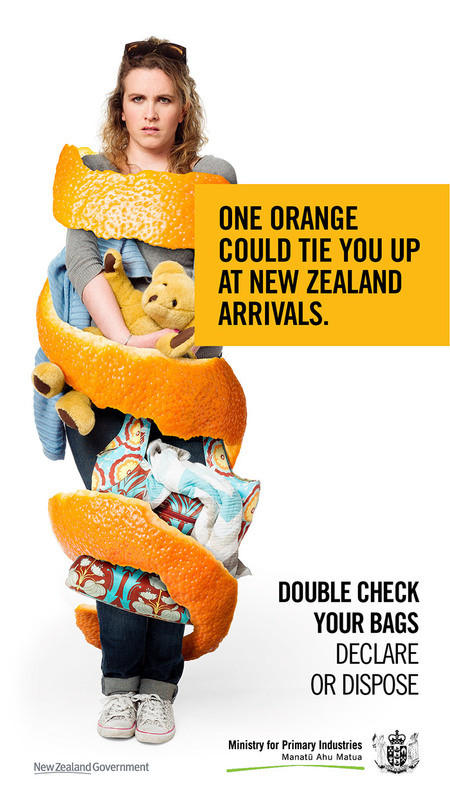 Previously MPI had focused on the fine, or on encouraging travellers to care for NZ’s environment, as ways to discourage travellers from bringing prohibited fruit into NZ. The GSL Promotus insight introduced a new direction – avoiding the time delays, embarrassment and hassle (as well as cost) if you are found with undeclared prohibited items in your luggage. We developed an engaging device showing how a simple piece of fruit can literally “tie you up” in Biosecuirty. This creative has been extremely well received – check it out next time you are flying out of Australia! Contact us now to find out more about how we have helped MPI develop engaging creative for various Biosecurity messages.